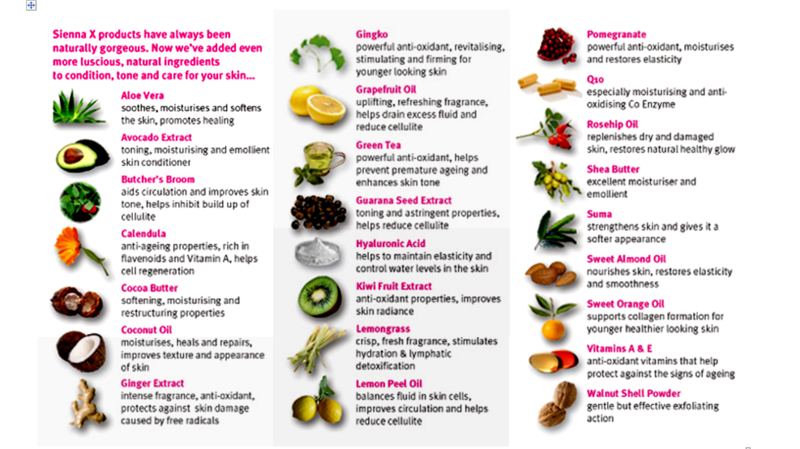 As with all our products here at Spata Health & Beauty, we endeavour to use the best available so that our customers benefit from the highest and safest quality ingredients and treatments. This is why we have chosen sienna X as our preferred spray tanning system. Dihydroxyacetone, DHA was first discovered by the Germans in the late 1920’s when DHA spilled on the skin and produced a brown colour. DHA has been listed with the Food and Drug Administration (FDA) since 1973, and has been used in cosmetic preparations for almost 30 years. DHA is not absorbed through the skin into the body and it has no known toxicity. The skin is made up of two main layers: the epidermis and dermis. The epidermis is also made up of layers. 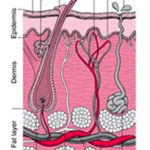 The outermost layer of the epidermis, the stratum corneum (or horny layer), is where self tanning occurs. DHA reacts with amino acids on the skin and oxygen in the air causing skin to turn brown, giving the appearance of a tan. A good example of this reaction is if you take a bite out of an apple and leave it on the side for a few hours it starts to turn brown. Fake tan works in a similar way on the skin. Every day millions of dead skin cells are sloughed or worn away from the surface of the skin. Actually, every 35 to 45 days you have an entirely new epidermis. That is why the colour change produced by DHA creating the tan effect will gradually fade. A sunless tan Will usually lasts about 5-7 days, although the sienna X retail range of pre and post tan care products is designed to help your customers keep theirs for longer. Spray tanning is now more popular than ever before thanks to sienna X developments in product formulations and application equipment. and there’s no drying time! Your sienna X Spray Tan here at Spata will be a great experience! We will supply you with disposable underwear, sticky feet pads and hair protection and as there’s no drying time you’ll be on your way with a gorgeous tan in no time! … and can be held at your own venue! Larger Parties (10+): Hostess Free! We will bring everything needed for your group’s tanning session, including our sienna X pop-up cubicle, so you don’t need to worry about a thing! Yes, very safe. A sienna X sunless tan can give the same results as spending up to 2 weeks in the sun but without the harmful effects of the sun’s rays. DHA has been approved by the FDA for over 30 years. Allergic reactions are extremely rare, however if you have experienced allergic reactions to self-tanning or other beauty products please arrange a skin patch test with us first. What will happen before, during and after my treatment? On your first tanning treatment you will be required to complete a consultation card specifically relating to your sienna X treatment. We will provide you with disposable underwear, cap and sticky feet which you will then change into (or you can bring your own dark underwear or swimwear). Barrier cream will be applied to your hands, elbows, knees, feet and other dry areas to reduce tan absorption. Simply follow your therapist’s instructions, spraying will take around 10 minutes. The guide colour you see will be showered off after your development time of 8 hours to reveal your natural looking sienna X tan. How dark will I get? sienna X has a range of solutions and your therapist will help you bespoke your ideal tan. Your tan results will depend on how well you tan naturally. The darker you tan in the sun, the darker you tan with sienna X. Many people like to bespoke their tan so it’s lighter in the winter months and darker in the summer. A double exposure treatment (i.e. if you have a second application within 48 hours of your first appointment) will help you go darker with superior results. How long will my siennaX sunless tan last? Your tan will last approximately 5 to 7 days depending on your daily skincare regime, lifestyle and if you have exfoliated will prior to your tan. A sunless tan fades just like a tan from the sun – so as your skin sheds dead cells, your tan will fade, so it is really important to moisturise daily. Using the sienna X Gradual Glowing Self Tan after day three will also prolong and top up your tan. sienna X have a full range of luxurious retail products to care for your skin and your tan. Speak to your therapist for details. Will I still need to use sun protection with a sienna X tan? Yes – a sunscreen with an SPF of 20 or more is recommended. are asthmatic or have breathing difficulties. Any further questions, please speak to your therapist before your appointment.